At an early age, Wes Stepp, fell in love with the art of cooking. He credits his passion to growing up in his mother’s kitchen and being involved in the daily preparation of family meals. Chef Wes strongly believes in using the freshest, local ingredients available, as well as serving generous portions. His mantra is ‘the first bite is taken with your eyes’ and it is quite apparent in the eclectic presentation served up by Wes. In addition to teaching cooking classes at Red Sky as well as other locations, Chef Wes has become in demand for computer videos as well as a multitude of television appearances that showcase his charismatic personality and creativity with food. 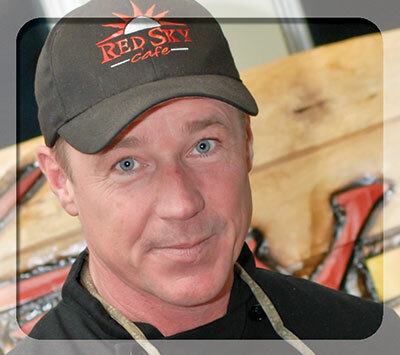 Wes is the proud father of three children who are all involved in the daily operations of Red Sky. His son was so influenced by his father’s passion, that he is a soon-to-be graduate of the Culinary Institute of America. Red Sky Café has earned the reputation of a charming, eclectic restaurant where one will always receive a great meal with stellar service. Just like Wes himself, Red Sky is a down to earth kind of place where one can come after a long day spent on the beach, to celebrate a special occasion or just to have a spectacular meal.